A positive combination of Sun and combust Moon in the twelfth house of a horoscope in the sign of Pisces can bless the native with good results related to marriage, profession, fame, authority and many other types of good results depending on the overall tone of his horoscope. Some natives under the positive influence of such a combination of Sun and combust Moon may experience many types of benefic results through their marriages, if their overall horoscopes are supportive for such results. A positive combination of Sun and combust Moon in the twelfth house in the sign of Pisces can bless some natives with life partners who may belong to foreign countries and these natives may settle abroad on the basis of their marriages. For example, if a positive combination of Sun and combust Moon is placed in the twelfth house of a horoscope in the sign of Pisces, positive Jupiter is placed in the first house of this horoscope in the sign of Aries and positive Venus is also placed in the first house of this horoscope along with positive Jupiter, the native may come across this outcome. The native supported by positive combust Moon in the twelfth house in the sign of Pisces and other positive planets may get married to a woman who may belong to a foreign country and he may settle in the country of his wife on the basis of his marriage. A positive combination of Sun and combust Moon in the twelfth house in the sign of Pisces can also bless the natives with success, fame and authority through many types of professions, when promoted by the right type of positive planets in the horoscopes of these natives. 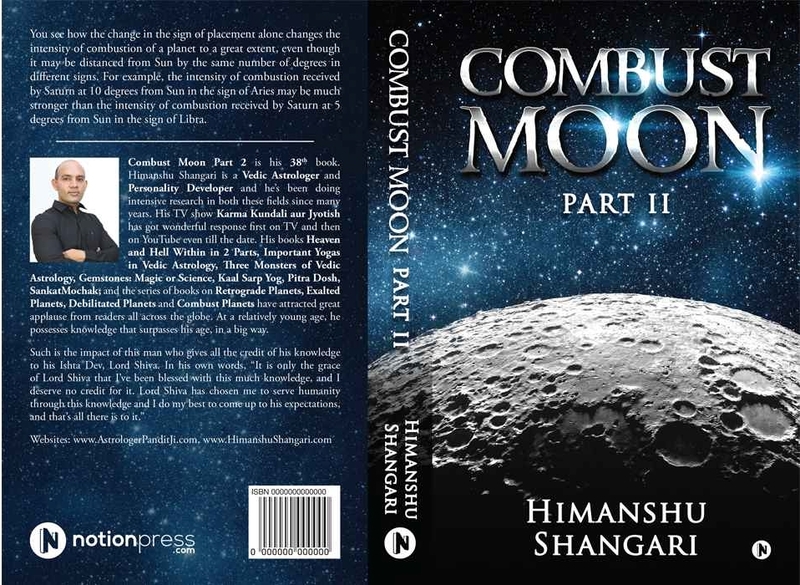 Such positive combust Moon can make some natives interested in the field of science due to which these natives may engage in professions related to this field and they may achieve success as scientific researchers, IT professionals, software developers, engineers, astronomers, web developers, doctors, architects and other such professionals. For example, if a positive combination of Sun and combust Moon is placed in the twelfth house of a horoscope in the sign of Pisces, positive Mars is placed in the eleventh house of this horoscope in the sign of Aquarius, positive Saturn is placed in the eighth house of this horoscope in the sign of Scorpio and positive Venus is placed in the tenth house of this horoscope in the sign of Capricorn, the native may become a scientific researcher. The native supported by positive combust Moon in the twelfth house in the sign of Pisces and other positive planets may follow the course of his higher studies in a branch of science and he may start researching in that subject after finishing his studies. The joint influence of such positive combust Moon and other positive planets can bless this native with good results through this field of profession and he may earn significant amount of money and success as a scientist. At the same time, if positive Jupiter is placed in the eighth house of this horoscope in the sign of Scorpio along with positive Saturn, positive Rahu is placed in the ninth house of this horoscope in the sign of Sagittarius and positive Ketu is placed in the third house of this horoscope in the sign of Gemini, the equation may improve a lot. The native supported by positive combust Moon in the twelfth house in the sign of Pisces and other positive planets may go to a foreign country as a scientific researcher and he may enjoy very good amount of money, success and recognition as a scientist in such foreign country. Apart from this, a positive combination of Sun and combust Moon in the twelfth house in the sign of Pisces can bless the natives with positive results through many other fields of profession, when working in tune with profession building planets in the horoscopes of these natives. On the other hand, a negative combination of Sun and combust Moon in the twelfth house of a horoscope in the sign of Pisces can trouble the native with problems related to marriage, profession, health and many other types of problems depending on the overall tone of his horoscope. Such negative combination of Sun and combust Moon can create problems in the marriages of some natives due to which these natives may face many types of issues related to this field. A negative combination of Sun and combust Moon in the twelfth house in the sign of Pisces can cause disturbances in the marriages of some natives and these disturbances may aggravate with the intervention of other negative planets in their horoscopes. In an extreme case of this type when assisted by other negative planets, a negative combination of Sun and combust Moon in the twelfth house of a horoscope in the sign of Pisces can break more than one marriage of the native on account of serious problems in such marriages and in some of these cases, the native may choose to remain single after one or two broken marriages. A positive combination of Sun and combust Moon in the twelfth house of a horoscope in the sign of Aquarius can bless the native with good results related to marriage, profession, fame, authority and many other types of good results depending on the overall tone of his horoscope. Such positive combust Moon can bless some natives with favorable results through their marriages, when working in tune with marriage boosting planets in the horoscopes of these natives. A positive combination of Sun and combust Moon in the twelfth house in the sign of Aquarius can bless some natives with life partners who may have well established professions and these natives may witness gains through such marriages. For example, if a positive combination of Sun and combust Moon is placed in the twelfth house of a horoscope in the sign of Aquarius, positive exalted Venus is placed in the first house of this horoscope in the sign of Pisces and positive Mercury is placed in the eleventh house of this horoscope in the sign of Capricorn, the native may experience this outcome. The native supported by positive combust Moon in the twelfth house in the sign of Aquarius and other positive planets may get married to a woman who may have a well established profession and the native may benefit through this marriage. Such positive combust Moon can also bless the natives under its influence with favorable results through many fields of profession, when working in the company of profession boosting planets in the horoscopes of these natives. A positive combination of Sun and combust Moon in the twelfth house in the sign of Aquarius can bless some natives with posts of authority in the house of government through jobs or through politics; and these natives may achieve such authority as revenue officers, judges, army officers, administrative officers, politicians, engineers and many other types of professionals. For example, if a positive combination of Sun and combust Moon is placed in the twelfth house of a horoscope in the sign of Aquarius, positive Mercury is also placed in the twelfth house of this horoscope, positive exalted Venus is placed in the first house of this horoscope in the sign of Pisces and positive Mars is placed in the second house of this horoscope in the sign of Aries, the native may become a revenue officer. The native supported by positive combust Moon in the twelfth house in the sign of Aquarius and other positive planets may get selected for a post of authority in revenue services and he may enjoy success and recognition through this field of profession. At the same time, if positive Jupiter is placed in the tenth house of this horoscope in the sign of Sagittarius and positive Saturn is placed in the third house of this horoscope in the sign of Taurus when all other planets are placed in the already mentioned houses of this horoscope, the equation may improve a lot. The native supported by positive combust Moon in the twelfth house in the sign of Aquarius and other positive planets may achieve success in competitive exams for selection in the revenue services and by virtue of such success, he may get selected for the highest possible direct rank in the revenue services. The joint influence of such positive combust Moon and other positive planets can bless this native with very good amount of success and recognition as a revenue officer and he may enjoy many privileges by virtue of this job of authority. Apart from this, a positive combination of Sun and combust Moon in the twelfth house in the sign of Aquarius can bless the natives with success, fame and authority through many other fields of profession, when working in tune with profession building planets in the horoscopes of these natives. On the other hand, a negative combination of Sun and combust Moon in the twelfth house of a horoscope in the sign of Aquarius can trouble the native with problems related to marriage, profession, health and many other types of problems depending on the overall tone of his horoscope. Such negative combination of Sun and combust Moon can adversely affect the marriages of some natives due to which these natives may have to face a variety of problems related to their marriages. A negative combination of Sun and combust Moon in the twelfth house in the sign of Aquarius can introduce the factor of extramarital affair to the marriages of some natives and this factor may aggravate with the introduction of other negative planets to the horoscopes of these natives. In an extreme case of this type when working in tune with other negative planets, a negative combination of Sun and combust Moon in the twelfth house of a horoscope in the sign of Aquarius can break more than one marriage of the native on account of various types of problems in such marriages; and his first marriage may break due to an extramarital affair. A positive combination of Sun and combust Moon in the twelfth house of a horoscope in the sign of Capricorn can bless the native with good results related to marriage, profession, fame, authority and many other types of good results depending on the overall tone of his horoscope. Such positive combust Moon can bless some natives with many types of benefic results through their marriages, if this combination is approved by marriage supporting planets in the horoscopes of these natives. A positive combination of Sun and combust Moon in the twelfth house in the sign of Capricorn can get some natives married to people who may hail from foreign countries and these natives may settle abroad on the basis of their marriages. For example, if a positive combination of Sun and combust Moon is placed in the twelfth house of a horoscope in the sign of Capricorn along with positive Mercury, positive Venus is placed in the first house of this horoscope in the sign of Aquarius and positive Saturn is placed in the seventh house of this horoscope in the sign of Leo, the native may receive this outcome. The native under the joint influence of this positive combination of Sun and combust Moon in the twelfth house in the sign of Capricorn and other positive planets may get married to a woman who may belong to a foreign country and he may settle in her country after his marriage. When accompanied by profession promoting planets in the horoscopes of the natives under its influence, a positive combination of Sun and combust Moon in the twelfth house in the sign of Capricorn can bless these natives with positive results through a number of professional fields. Such positive combust Moon can make some natives interested in the field of science due to which these natives may engage in professions related to this field and they may achieve success as IT professionals, doctors, engineers, astronomers, web developers, software developers, architects, scientific researchers and other such professionals. For example, if a positive combination of Sun and combust Moon is placed in the twelfth house of a horoscope in the sign of Capricorn, positive Mercury is placed in the first house of this horoscope in the sign of Aquarius, positive Venus is also placed in the first house of this horoscope along with positive Mercury; and positive Saturn is placed in the sixth house of this horoscope in the sign of Cancer, the native may become a doctor. The native supported by positive combust Moon in the twelfth house in the sign of Capricorn and other positive planets may follow the course of his higher studies in a branch of medical science and he may become a professional doctor after finishing his studies. The joint influence of such positive combust Moon and other positive planets can bless this native with favorable results through his practice as a doctor and he may earn good amount of money and success through this field of profession. At the same time, if positive Jupiter is placed in the tenth house of this horoscope in the sign of Scorpio and positive Mars is placed in the eleventh house of this horoscope in the sign of Sagittarius when all other planets are placed in the already mentioned houses of this horoscope, the results may improve a lot. The native supported by positive combust Moon in the twelfth house in the sign of Capricorn and other positive planets may possess very good knowledge as a doctor and by means of such knowledge; he may earn very good amount of money, success and recognition through the field of medical science. Apart from this, a positive combination of Sun and combust Moon in the twelfth house in the sign of Capricorn can bless the natives with favorable results through many other professional fields, if present in the company of profession building planets in the horoscopes of these natives. On the other hand, a negative combination of Sun and combust Moon in the twelfth house of a horoscope in the sign of Capricorn can trouble the native with problems related to marriage, profession, health and many other types of problems depending on the overall tone of his horoscope. Such negative combination of Sun and combust Moon can hit some natives in the field of their marriage due to which these natives may come across many types of problems related to this field. A negative combination of Sun and combust Moon in the twelfth house in the sign of Capricorn can delay the marriages of some natives and this delay may become longer, if this combination is assisted by other negative planets in their horoscopes. In an extreme case of this type when working in accordance with other negative planets, a negative combination of Sun and combust Moon in the twelfth house of a horoscope in the sign of Capricorn can delay the marriage of the native till his age of 41; and he may also have to suffer from at least one broken engagement. A positive combination of Sun and combust debilitated Moon in the twelfth house of a horoscope in the sign of Scorpio can bless the native with good results related to marriage, profession, authority, fame and many other types of good results depending on the overall tone of his horoscope. Some natives may witness good results through their marriages, when such positive combust debilitated Moon is boosted by marriage favoring planets in their horoscopes. A positive combination of Sun and combust debilitated Moon in the twelfth house in the sign of Scorpio can bless some natives with life partners who may have well established professions and these natives may benefit through their marriages. For example, if a positive combination of Sun and combust debilitated Moon is placed in the twelfth house of a horoscope in the sign of Scorpio, positive Venus is placed in the first house of this horoscope in the sign of Sagittarius and positive Mercury is also placed in the first house of this horoscope along with positive Venus, the native may experience such marriage. The native supported by positive combust debilitated Moon in the twelfth house in the sign of Scorpio and other positive planets may get married to a woman who may have a well established profession and she may enjoy good status due to her professional success. When present in tune with profession boosting planets in the horoscopes of the natives influenced by it, a positive combination of Sun and combust debilitated Moon in the twelfth house in the sign of Scorpio can bless these natives with success, authority and fame through many fields of profession. A positive combination of Sun and combust debilitated Moon in the twelfth house in the sign of Scorpio can render special interests and abilities to some natives under its influence due to which these natives may engage in professions like tantra, numerology, astrology and other such fields; and they may achieve favorable results through them. For example, if a positive combination of Sun and combust debilitated Moon is placed in the twelfth house of a horoscope in the sign of Scorpio, positive Mars is placed in the third house of this horoscope in the sign of Aquarius, positive Jupiter is placed in the first house of this horoscope in the sign of Sagittarius and positive Venus is placed in the eleventh house of this horoscope in the sign of Libra, the native may become a tantric. The native supported by positive combust debilitated Moon in the twelfth house in the sign of Scorpio and other positive planets may achieve significant knowledge of tantra by spending many years in the study of this science. The native under the joint influence of such positive combust debilitated Moon and other positive planets may become a professional tantric, and he may earn good amount of money and recognition through the field of tantra. At the same time, if positive Rahu is placed in the eighth house of this horoscope in the sign of Cancer, positive Ketu is placed in the second house of this horoscope in the sign of Capricorn and positive Mercury is placed in the twelfth house of this horoscope in the sign of Scorpio along with positive Sun and combust debilitated Moon when all other planets are placed in the already mentioned houses of this horoscope, the results may improve a lot. The native supported by positive combust debilitated Moon in the twelfth house in the sign of Scorpio and other positive planets may have very good knowledge of tantra and virtue of such knowledge; he may earn very good amount of success, money and recognition as a tantric. Apart from this, a positive combination of Sun and combust debilitated Moon in the twelfth house in the sign of Scorpio can bless the natives with positive results through many other fields of profession, if working in the presence of profession approving planets in the horoscopes of these natives. On the other hand, a negative combination of Sun and combust debilitated Moon in the twelfth house of a horoscope in the sign of Scorpio can trouble the native with problems related to marriage, profession, health and many other types of problems depending on the overall tone of his horoscope. Some natives may witness the heat of such negative combination of Sun and combust debilitated Moon in the field of their profession due to which they may have to face many types of issues related to this field. A negative combination of Sun and combust debilitated Moon in the twelfth house in the sign of Scorpio can delay the professional success of some natives due to which these natives may not achieve much success till late in their lives. In an extreme case of this type when present in the company of other negative planets, a negative combination of Sun and combust debilitated Moon in the twelfth house of a horoscope in the sign of Scorpio can delay the professional success of the native till his age of 41; or he may not achieve such success for his entire life. A positive combination of debilitated Sun and combust Moon in the twelfth house of a horoscope in the sign of Libra can bless the native with good results related to marriage, profession, fame, authority and many other types of good results depending on the overall tone of his horoscope. Such positive combust Moon can make some natives witness many types of gains through their marriages, when working in tune with marriage promoting planets in the horoscopes of these natives. A positive combination of debilitated Sun and combust Moon in the twelfth house in the sign of Libra can bless some natives with life partners who may belong to foreign countries and these natives may settle abroad on the basis of their marriages. For example, if a positive combination of debilitated Sun and combust Moon is placed in the twelfth house of a horoscope in the sign of Libra, positive Venus is placed in the first house of this horoscope in the sign of Scorpio and positive exalted Jupiter is placed in the ninth house of this horoscope in the sign of Cancer, the native may experience such marriage. The native supported by positive combust Moon in the twelfth house in the sign of Libra and other positive planets may get married to a woman who may be the citizen of a foreign country and the native may settle in her country after his marriage. A positive combination of debilitated Sun and combust Moon in the twelfth house in the sign of Libra can also bless the natives with success, authority and fame through a number of professions, if working in accordance with profession approving planets in their horoscopes. Such positive combust Moon can bend some natives towards the field of hospitality due to which these natives may engage in professions related to this field and they may achieve success as professionals dealing in shipping cruise industry, travel industry, hotel industry, event management industry, airline industry, cinema industry and other such professions. For example, if a positive combination of debilitated Sun and combust Moon is placed in the twelfth house of a horoscope in the sign of Libra, positive Venus is placed in the tenth house of this horoscope in the sign of Leo, positive Rahu is placed in the ninth house of this horoscope in the sign of Cancer and positive Ketu is placed in the third house of this horoscope in the sign of Capricorn, the native may witness this outcome. The native supported by positive combust Moon in the twelfth house in the sign of Libra and other positive planets may engage in the field of shipping cruise industry and he may come across good results through this field. The joint influence of such positive combust Moon and other positive planets can bless this native with a well paying job related to shipping cruise industry and he may come across good amount of money and success through this field of profession. At the same time, if positive retrograde Jupiter is placed in the fifth house of this horoscope in the sign of Pisces, positive Mars is placed in the seventh house of this horoscope in the sign of Taurus and positive retrograde Saturn is placed in the third house of this horoscope in the sign of Capricorn along with positive Ketu when all other planets are placed in the already mentioned houses of this horoscope, the equation may improve a lot. The native supported by positive combust Moon in the twelfth house in the sign of Libra and other positive planets may become the owner of a cruise liner and he may earn very good amount of money, success and growth through the field of shipping cruise industry. Apart from this, a positive combination of debilitated Sun and combust Moon in the twelfth house in the sign of Libra can bless the natives with success, fame and authority through many other fields of profession, depending on the type of positive planets which assist this combination in the horoscopes of these natives. On the other hand, a negative combination of debilitated Sun and combust Moon in the twelfth house of a horoscope in the sign of Libra can trouble the native with problems related to marriage, profession, health and many other types of problems depending on the overall tone of his horoscope. Such negative combination of debilitated Sun and combust Moon can target the professions of some natives under its influence and it can create many types of problems related to this sphere. A negative combination of debilitated Sun and combust Moon in the twelfth house in the sign of Libra can keep some natives jobless many times in their lives and this problem may aggravate with the intervention of other negative planets in the horoscopes of these natives. In an extreme case of this type when supported by other negative planets, a negative combination of debilitated Sun and combust Moon in the twelfth house of a horoscope in the sign of Libra can make the native engage in temporary jobs for his entire life and he may not find a permanent profession. A positive combination of Sun and combust Moon in the twelfth house of a horoscope in the sign of Virgo can bless the native with good results related to marriage, profession, authority, fame and many other types of good results depending on the overall tone of his horoscope. Some natives may witness benefic results through their marriages, when such positive combust Moon is promoted by marriage boosting planets in their horoscopes. A positive combination of Sun and combust Moon in the twelfth house in the sign of Virgo can bless some natives with life partners who may be the citizens of foreign countries and these natives may settle in their countries on the basis of their marriages. For example, if a positive combination of Sun and combust Moon is placed in the twelfth house of a horoscope in the sign of Virgo, positive debilitated Venus is also placed in the twelfth house of this horoscope and positive Mars is placed in the first house of this horoscope in the sign of Libra along with positive Mercury, the native may experience such marriage. The native supported by positive combust Moon in the twelfth house in the sign of Virgo and other positive planets may get married to a woman who may be a foreign national and he may settle abroad on the basis of his marriage. When working in harmony with profession boosting planets in the horoscopes of the natives influenced by it, a positive combination of Sun and combust Moon in the twelfth house in the sign of Virgo can bless these natives with success, authority and fame through many fields of profession. A positive combination of Sun and combust Moon in the twelfth house in the sign of Virgo can render special interests and abilities to some natives under its influence due to which these natives may engage in professions like astrology, numerology, tantra and other such fields; and they may achieve favorable results through them. For example, if a positive combination of Sun and combust Moon is placed in the twelfth house of a horoscope in the sign of Virgo, positive Mercury is placed in the first house of this horoscope in the sign of Libra, positive retrograde Venus is placed in the second house of this horoscope in the sign of Scorpio and positive Saturn is placed in the eighth house of this horoscope in the sign of Taurus, the native may become an astrologer. The native supported by positive combust Moon in the twelfth house in the sign of Virgo and other positive planets may achieve significant knowledge of astrology by spending a long period of time in the study of astrology. The native under the joint influence of such positive combust Moon and other positive planets may become a professional astrologer and he may come across significant amount of money and success through the field of astrology. At the same time, if positive Rahu is placed in the fifth house of this horoscope in the sign of Aquarius, positive Ketu is placed in the eleventh house of this horoscope in the sign of Leo and positive Mars is placed in the sixth house of this horoscope in the sign of Pisces when all other planets are placed in the already mentioned houses of this horoscope, the results may improve a lot. The native supported by positive combust Moon in the twelfth house in the sign of Virgo and other positive planets may possess very good expertise in the field of astrology and virtue of such expertise; he may earn very good amount of success, money and recognition as an astrologer. Apart from this, a positive combination of Sun and combust Moon in the twelfth house in the sign of Virgo can bless the natives with positive results through many other fields of profession, if working in the presence of profession building planets in the horoscopes of these natives. On the other hand, a negative combination of Sun and combust Moon in the twelfth house of a horoscope in the sign of Virgo can trouble the native with problems related to marriage, profession, health and many other types of problems depending on the overall tone of his horoscope. Some natives may witness the heat of such negative combination of Sun and combust Moon in the field of their profession due to which they may have to face many types of issues related to this field. A negative combination of Sun and combust Moon in the twelfth house in the sign of Virgo can make some natives suffer from financial losses through their professions and these losses may increase in quantum, with the intervention of other malefic planets in the horoscopes of these natives. In an extreme case of this type when present in the company of other negative planets, a negative combination of Sun and combust Moon in the twelfth house of a horoscope in the sign of Virgo can afflict the native with such big financial losses through his profession that he may turn bankrupt and he may have to start it all over again. A positive combination of Sun and combust Moon in the twelfth house of a horoscope in the sign of Leo can bless the native with good results related to marriage, profession, fame, authority and many other types of good results depending on the overall tone of his horoscope. Some natives may receive the blessings of such positive combust Moon through their marriages, if this combination is approved by marriage promoting planets in the horoscopes of these natives. A positive combination of Sun and combust Moon in the twelfth house in the sign of Leo can get some natives married to people who may be rich and these natives may benefit through their marriages. For example, if a positive combination of Sun and combust Moon is placed in the twelfth house of a horoscope in the sign of Leo, positive Venus is placed in the eleventh house of this horoscope in the sign of Cancer and positive exalted Jupiter is also placed in the eleventh house of this horoscope along with positive Venus, the native may come across this outcome. The native under the joint influence of this positive combination of Sun and combust Moon in the twelfth house in the sign of Leo and other positive planets may get married to a woman who may be rich and the native may come across gains through this marriage. A positive combination of Sun and combust Moon in the twelfth house in the sign of Leo can also bless the natives with positive results through many fields of profession, when this combination is boosted by profession building planets in the horoscopes of these natives. Such positive combust Moon can make some natives interested in the field of science due to which these natives may engage in professions connected to this field and they may achieve success as web developers, software developers, doctors, engineers, IT professionals, astronomers and other such professionals. For example, if a positive combination of Sun and combust Moon is placed in the twelfth house of a horoscope in the sign of Leo, positive Mercury is also placed in the twelfth house of this horoscope, positive Venus is placed in the second house of this horoscope in the sign of Libra and positive Jupiter is placed in the seventh house of this horoscope in the sign of Pisces, the native may become a software developer. The native supported by positive combust Moon in the twelfth house in the sign of Leo and other positive planets may take a course in software development and he may become a professional software developer after completing such course. The joint influence of such positive combust Moon and other positive planets can bless this native with positive results through the field of software development and he may earn significant amount of money and success as a software developer. At the same time, if positive Saturn is placed in the ninth house of this horoscope in the sign of Taurus and positive Mars is placed in the sixth house of this horoscope in the sign of Aquarius when all other planets are placed in the already mentioned houses of this horoscope, the results may improve a lot. The native supported by positive combust Moon in the twelfth house in the sign of Leo and other positive planets may go to a foreign country as a software developer and he may earn very good amount of money, success and recognition through the field of software development in such foreign country. Apart from this, a positive combination of Sun and combust Moon in the twelfth house in the sign of Leo can bless the natives with benefic results through many other types of professions, when working in tune with profession approving planets in their horoscopes. On the other hand, a negative combination of Sun and combust Moon in the twelfth house of a horoscope in the sign of Leo can trouble the native with problems related to marriage, profession, health and many other types of problems depending on the overall tone of his horoscope. Some natives may feel the harmful influence of this combination in the field of their profession due to which they may witness many types of problems related to this field. A negative combination of Sun and combust Moon in the twelfth house in the sign of Leo can keep some natives jobless many times in their lives and this problem may intensify with the addition of other negative planets to their horoscopes. In an extreme case of this type when assisted by other negative planets, a negative combination of Sun and combust Moon in the twelfth house of a horoscope in the sign of Leo can keep the native away from permanent profession for his entire life and he may only find temporary jobs from time to time. A positive combination of Sun and combust Moon in the twelfth house of a horoscope in the sign of Cancer can bless the native with good results related to marriage, profession, fame, authority and many other types of good results depending on the overall tone of his horoscope. Some natives under the positive influence of such a combination of Sun and combust Moon may come across its benefits through the field of their marriage due to which they may experience many types of benefic results by virtue of their marriages. A positive combination of Sun and combust Moon in the twelfth house in the sign of Cancer can bless some natives with life partners who may belong to foreign countries and these natives may settle abroad on the basis of their marriages. For example, if a positive combination of Sun and combust Moon is placed in the twelfth house of a horoscope in the sign of Cancer, positive Venus is also placed in the twelfth house of this horoscope and positive Saturn is placed in the eighth house of this horoscope in the sign of Pisces, the native may receive this outcome. The native supported by positive combust Moon in the twelfth house in the sign of Cancer and other positive planets may get married to a woman who may be the citizen of a foreign country and he may settle in her country on the basis of his marriage. The positive influence of a combination of Sun and combust Moon in the twelfth house in the sign of Cancer can bless the natives under its influence with success, fame and authority through many fields of profession, when joined by the right type of benefic planets in the horoscopes of these natives. Some natives under the influence of such positive combust Moon may get blessed with creative abilities, they may engage in creative professions relevant to their abilities and they may achieve success as singers, actors, musicians, dancers, writers, designers, directors, developers and other such professionals. For example, if a positive combination of Sun and combust Moon is placed in the twelfth house of a horoscope in the sign of Cancer, positive Mercury is also placed in the twelfth house of this horoscope, positive Venus is placed in the tenth house of this horoscope in the sign of Taurus and positive Mars is placed in the first house of this horoscope in the sign of Leo, the native may become a musician. The native supported by positive combust Moon in the twelfth house in the sign of Cancer and other positive planets may possess good talent related to music composition and he may engage in this field on professional basis. The joint influence of such positive combust Moon and other positive planets may bless this native with significant amount of money and recognition as a music composer. At the same time, if positive Rahu is placed in the third house of this horoscope in the sign of Libra, positive Ketu is placed in the ninth house of this horoscope in the sign of Aries and positive Jupiter is placed in the fifth house of this horoscope in the sign of Sagittarius, the results may improve a lot. The native supported by positive combust Moon in the twelfth house in the sign of Cancer and other positive planets may possess great abilities related to music composition and by virtue of such abilities; he may earn very good amount of money, success, recognition and fame as a music composer. Apart from this, a positive combination of Sun and combust Moon in the twelfth house in the sign of Cancer can bless the natives with positive results through many other fields of profession, when working in the presence of profession favoring planets in the horoscopes of these natives. On the other hand, a negative combination of Sun and combust Moon in the twelfth house of a horoscope in the sign of Cancer can trouble the native with problems related to marriage, profession, health and many other types of problems depending on the overall tone of his horoscope. Such negative combination of Sun and combust Moon can hit some natives in the field of their profession due to which these natives may suffer from many types of problems related to this sphere. A negative combination of Sun and combust Moon in the twelfth house in the sign of Cancer can delay the professional success of some natives and such delay may prolong, if this combination receives support from other negative planets in the horoscopes of these natives. In an extreme case of this type when supported by other negative planets, a negative combination of Sun and combust Moon in the twelfth house of a horoscope in the sign of Cancer can keep the native away from significant professional success till his age of 41; unless there is a strong profession boosting planet in his horoscope. A positive combination of Sun and combust Moon in the twelfth house of a horoscope in the sign of Gemini can bless the native with good results related to marriage, profession, fame, authority and many other types of good results depending on the overall tone of his horoscope. Such positive combust Moon can make some natives experience many types of good results through their marriages, when working in tune with marriage approving planets in the horoscopes of these natives. A positive combination of Sun and combust Moon in the twelfth house in the sign of Gemini can bless some natives with life partners who may belong to foreign countries and these natives may settle abroad on the basis of their marriages. For example, if a positive combination of Sun and combust Moon is placed in the twelfth house of a horoscope in the sign of Gemini, positive Venus is also placed in the twelfth house of this horoscope and positive Jupiter is placed in the second house of this horoscope in the sign of Leo, the native may experience such marriage. The native supported by positive combust Moon in the twelfth house in the sign of Gemini and other positive planets may get married to a woman who may be the citizen of a foreign country and he may settle in the country this woman on the basis of this marriage. A positive combination of Sun and combust Moon in the twelfth house in the sign of Gemini can also bless the natives with success, authority and fame through a number of professions, if working in association with profession supporting planets in their horoscopes. Such positive combust Moon can bend some natives towards the field of hospitality due to which these natives may engage in professions related to this field and they may achieve success as professionals dealing in hotel industry, travel industry, cinema industry, event management industry, shipping cruise industry, airline industry and other such professions. For example, if a positive combination of Sun and combust Moon is placed in the twelfth house of a horoscope in the sign of Gemini, positive Mercury is placed in the first house of this horoscope in the sign of Cancer, positive Venus is placed in the second house of this horoscope in the sign of Leo and positive Mars placed in the fourth house of this horoscope in the sign of Libra, the native may witness this outcome. The native supported by positive combust Moon in the twelfth house in the sign of Gemini and other positive planets may engage in the field of hotel industry and he may enjoy positive results through this field. The joint influence of such positive combust Moon and other positive planets can bless this native with a well paying job of authority related to hotel industry and he may earn significant amount of money and success through this field of profession. At the same time, if positive Rahu is placed in the fourth house of this horoscope in the sign of Libra along with positive Mars, positive Ketu is placed in the tenth house of this horoscope in the sign of Aries and positive Saturn is placed in the seventh house of this horoscope in the sign of Capricorn when all other planets are placed in the already mentioned houses of this horoscope, the equation may improve a lot. The native supported by positive combust Moon in the twelfth house in the sign of Gemini and other positive planets may become the owner of a hotel and he may enjoy very good amount of money, success and growth through the field of hotel industry. Apart from this, a positive combination of Sun and combust Moon in the twelfth house in the sign of Gemini can bless the natives with success, fame and authority through many other fields of profession, depending on the type of benefic planets which join this combination in the horoscopes of these natives. On the other hand, a negative combination of Sun and combust Moon in the twelfth house of a horoscope in the sign of Gemini can trouble the native with problems related to marriage, profession, health and many other types of problems depending on the overall tone of his horoscope. Such negative combination of Sun and combust Moon can hit the health of some natives under its influence and it can create many types of problems related to this sphere. A negative combination of Sun and combust Moon in the twelfth house in the sign of Gemini can get some natives addicted to harmful drugs and this problem may aggravate with the addition of other negative planets to the horoscopes of these natives. In an extreme case of this type when supported by other negative planets, a negative combination of Sun and combust Moon in the twelfth house of a horoscope in the sign of Gemini can claim the life of the native at a young age by virtue of drug overdose or by virtue of a serious health condition caused due to heavy consumption of harmful drugs on regular basis.